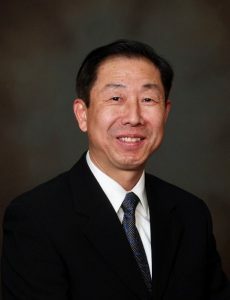 Michael Bailou Huang, Director of Global Library Initiatives and a full librarian at the Health Sciences Library at Stony Brook University was named a Distinguished Librarian, the highest academic rank in the SUNY system. Since the program’s inception in 1963, SUNY has appointed 1,130 faculty to the distinguished ranks, as follows, including these most recent appointments: 408 Distinguished Professorships; 327 Distinguished Service Professorships; 388 Distinguished Teaching Professorships, and 7 Distinguished Librarian Professorships. More information about SUNY’s faculty award program is available at https://www.suny.edu/impact/education/faculty/distinguished-faculty-ranks. Michael Bailou Huang, Distinguished Librarian: Mr. Huang is Director of Global Library Initiatives and a full librarian at the Health Sciences Library at Stony Brook University. He has made significant contributions to Stony Brook University and the library profession locally, nationally and internationally. Through his teaching as a course instructor as well as through library workshops and consultations, Mr. Huang has contributed to the understanding of evidence based practice and the acquisition of information literacy skills for the students and faculty in Health Sciences programs at Stony Brook University. As Director of Global Library Initiatives, he has fostered sustainable partnerships with institutions abroad, furthering the global mission of Stony Brook University. Mr. Huang has an extensive scholarship record. He has authored 30 publications and delivered over 100 presentations at a variety of forums and conferences held in 14 countries including Austria, China, England, Germany, Japan, Malaysia, Norway, Portugal, and the United States. He is highly sought after as a keynote speaker to present his research and share his service philosophies and expertise regarding best practices in academic librarianship. Mr. Huang serves on the editorial boards for International Journal of Librarianship and Chinese Librarianship: An International Electronic Journal. He holds honorary professorships at Shanghai Normal University and Shandong Normal University. Mr. Huang is an exemplary colleague and mentor. He has previously received recognition for his service as a recipient of President’s Award for Excellence in Team Achievement, Outstanding Contribution by a New Member Award from NY-NJ Chapter of the Medical Library Association, and CALA President’s Recognition Award from the Chinese American Librarians Association, an affiliate of the American Library Association.